Children's Peace Monument located in the Hiroshima Peace Memorial Park, Japan is a memorial in remembrance of all the children who died as a result of dropping of atom bombs on Hiroshima and Nagasaki. 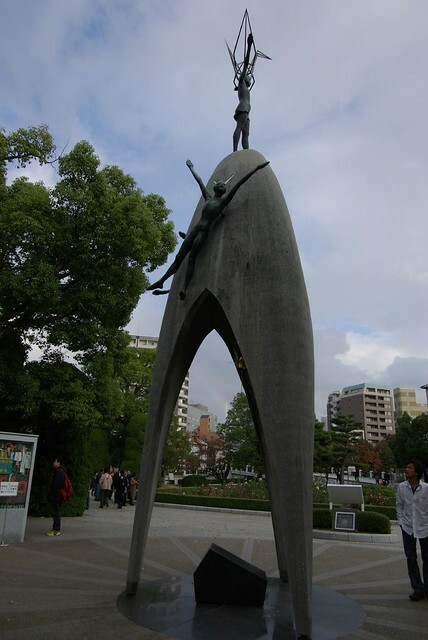 The memorial also known "Tower of Thousand Cranes" is based on the true and poignant story of a Sadako Sasaki, a young girl who died at the age of 12 years due to the nuclear radiation she had received on August 6, 1945 at the age of 2. The affect of radiation manifested in 1955 when she was diagnosed with radiation-induced leukaemia and was ultimately hospitalised. Based on a popular Japanese belief she innocently believed that if she made thousand origami birds (cranes) she would be cured of her disease. Although she was very weak but she was determined to make thousand cranes and tried to make thousand cranes so that she could get well. Unfortunately before she could reach her target, death took her away on the morning of October 25, 1955. Her friends and class mates shocked by her sudden illness and death decided to erect a memorial to comfort her soul and also to express their desire for peace. Their idea soon spread all over Japan and became not only a National but an International movement. 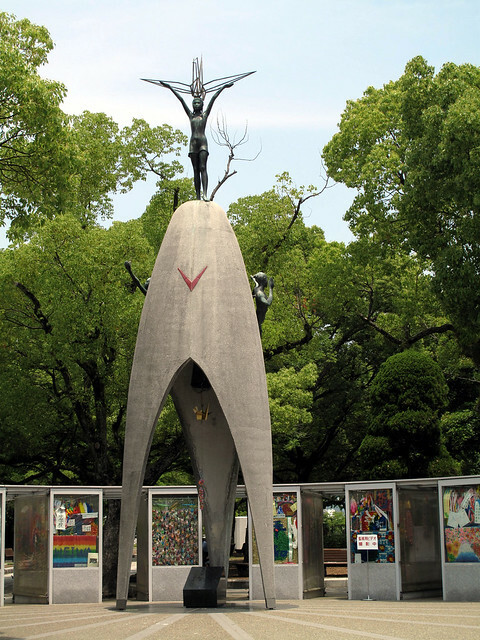 With the aid of funds raised through donations from over 3,100 schools in Japan and other foreign countries the monument was finally unveiled on Children's Day - May 5, 1958. Designed by native artists Kazuo Kikuchi and Kiyoshi Ikebe, the 20 metres high monument consists of a bomb shaped high hollow structure topped with statue of Sadako Sasaki holding over her head an origami crane with her outstretched arms conveying hope for a peace. Two more statues, one of a boy and other of a girl, are attached to the structure representing all the children who died due to bombing of the two towns. Under the main structure, a bronze crane hangs from a traditional peace bell. 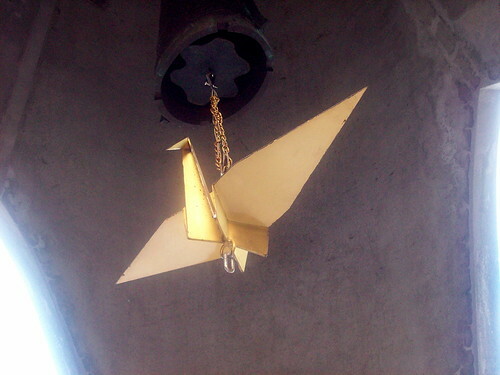 The bronze crane works as a wind chime when it is pushed against the bell. The bird and the bell were donated by Nobel Laureate in Physics, Hideki Yukawa, the Japanese theoretical physicist and the first Japanese to win the Nobel prize. For building peace in the world. Even today children from all over the World send colourful paper cranes to be placed at the memorial. Small cubicles around the memorial were added later to house these origami cranes strung on strings. As fresh batches arrive the older ones are taken away.